During his time in office, President Barack Obama declared numerous National Emergencies in order to extend his powers under The National Emergencies Act. The National Emergencies Act, which was first enacted in 1976, was written to make sure that the President of the United States would have various powers during times of emergency. The Act also set strict timelines to prevent any one president from using these powers for an indefinite amount of time. With his numerous declarations, President Obama set a disturbing trend that was started by President Bush right after the September 11th attacks. On September 14, 2001, President Bush enacted a National State of Emergency. Since that date both President Bush and Obama have managed to extend their power year after year by declaring various states of emergency. 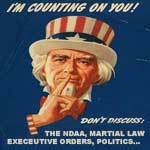 A couple of months back we highlighted a number of questionable Executive Orders that some people speculated were preparing this country for Martial Law. While some in the mainstream media would like you to believe that these are just conspiracy theories, created by crackpots hiding in their mothers basements, it seems some lawmakers can now be added to that crowd. Congress Woman Kay Granger of Texas issued a Press Release warning of the Presidents unprecedented power grab. In the letter she warned that President Obama and the Federal government had passed an Executive Order giving them the power to take over all the fundamental parts of our economy – in the name of national security – in times of national emergency. From the NDAA that gave the President the power to indefinitely detain American Citizens to the huge urban warfare drills in Chicago, Miami, Los Angeles , and Tampa; The United States is starting to look more and more like we are actually in the middle of a national emergency. Altogether, Clinton declared 17 national emergencies, Bush, 13, and Obama, 12, according to a list compiled by the Brennan Center . These unchecked powers will some day come back to haunt us. Even if this President never abuses these powers, the very fact that they have been enacted sets a dangerous trend that will ultimately lead to a country that looks nothing like what our founders intended. No one man or office should ever have unlimited authority over the people. Whether you agree with the person in office or not, this much power in one person’s hands is not a very comforting thought. Welcome to the evil empire, sit down shut up and do as you are told and everything will be alright. Let’s just keep voting for the demrepub party that contiues to screw this country everyway they can. Hi ~ I normally agree with your stance against Obama and did not like the last executive orders he signed in Jan and Mar 2012 giving him sole power etc. ~ but I reviewed the newest executive order and this does not fall into the category of the prior two executive orders… “U.S. President Barack Obama has ordered a one-year extension of the U.S. national emergency over Russian atomic material suitable for use in nuclear weapons. Obama submitted a notice of the extension for publication in the U.S. Federal Register on Monday. “The accumulation of a large volume of weapons-usable fissile material in the territory of the Russian Federation continues to pose an unusual and extraordinary threat to the national security and foreign policy of the United States,” Obama said in a message to the U.S. Congress accompanying the notice. 100% wrong on your assessment. This has nothing to do with stopping Russia. If Obama gave two shits about Russia he wouldn’t be rolling over to please them at every turn. He also wouldn’t have disarmed our nuclear warheads. Obama and every idiot before him have used one excuse after another to extend this act. If it wasn’t the Russian excuse it would have been something else. We all know he will do nothing to stop Russia. The true threat is the Muslim Movement in the United States. it is necessary to find out how much power Obama has given them. They are part of Homeland Security and numerous other important positions in this country. Their goal is to “Destroy the U.
S. from within”. They have a good grasp. do you? How do you feel today about Trump and Russia? Wake up and stand with President Trump who is doing the right thing for you and your children. One day you will wake up and realize that your nation has become another Venezuela and it will be too late to turn back the clock. Socialism spells death for America…Unite and stop that plague that will eve tally destroy all your freedoms. nah maybe one day you Trump Cultists wll wake the muck up, and STOP watching Fox/Faux Ultra Conservative FAR RIGHT News, how can it be that “ALL” the other News Stations, News Papers, Magazines, etc, get things wrong except for 1..Fox? lol stop drinking that darn Kool-Aid..Dam you Trumpettes are stunard and BYW I have no problem with a Wall but the GOP have always been about the Deficit when a Dem is in Office, Trumps heading us into another Recession by 2020 just like Bush Jr did, thanks God Oama got us out of that ASAP! excactly…. Trump and Russia no AMERICAN BANL WOULD LEND TRUMP ANYMORE LOOT SO YEAH collusion 4 sure def obstruction is why Comey and others were fired,Trump cultists r in denial! You mean the uranium rights our govt gave them are the reason it was extended this year instead of a falsified terrorist threat? Right about the same time they decided to invite armed Russian troops to CO to train with us? Shocking… NOT – have you woke up yet? This should make it clearer for those of logic who understand false flags and why they are implemented. Give a little of your freedom for security. Welcome to your police state and your eventual funeral. Should make it far clearer why two steel-framed structures free-fell to the ground on that fateful day and why WTC 7 was announced as fallen before it actually happened. Cause and effect. BTW: I can understand Russia’s proliferation issue as they sit back and watch one middle eastern nation fall after another–only to see the US driving the war machine. Parking a “missile shield” in Europe might pose a bit of a threat as well. This admin. does NOTHING positive for America. ANY EO he signs is for his benefit only and not for ours. The Patriot Act needs to go permanently and so does half of govt. – PUBLIC SECTOR EMPLOYEES, i.e. Fed. workers! We will know more by October. Turning up the heat of the frogs’s water, bit by bit. This explains all the amunition being bought. BO says one thing and does another,smoke and mirrors. We already know he hates the Constitution, and views it as an henderance. The media is totally silent because they are in the pocket of the DNC!!! A list contains dates or numbers or letters or bullet points, etc. The person who wrote this is a moron, who really should reconsider their career choice in writing. There is zero list. Yet all of you monkeys buy into instant hate toward an absent list. Provide an actual list so intelligent Americans can decide on their own what’a right and what’s wrong.